You've got a great boarding center, and you have employees who love animals. How's My Dog lets you build closer relationships with your customers and keeps them coming back for their boarding needs. Using the How's My Dog app, you can quickly capture an individual update for each of your pets, including a picture, activities, and updates from your center. The update is customizable and much faster than completing a paper update. 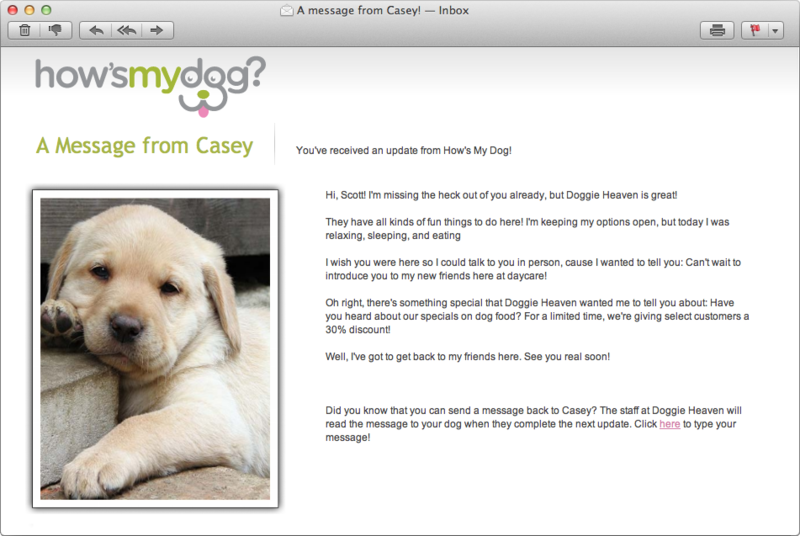 In less than a minute, you can complete the How's My Dog update on a smartphone or tablet. You'll have so much fun sending the daily updates to your customers, and you won't believe how easy it is to use! You're heading out of town, and you're going to miss your pet so much. Well, miss no more with How's My Dog! 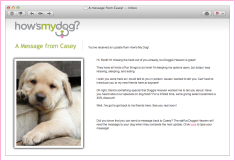 You'll receive a daily email update that is very specific to your pet that includes a photo, a photo caption, a list of your pet's activities that day, even a message from your pet! What else? You can also send a message back to your pet that will be read to him or her by the center! You just need to ask your favorite boarding center to sign up for the service, and they'll take care of the rest! Click on the image below to see a sample update!